Ladies and Gentleman, My name is Eddie O’Connor, and I’ve been a sinner. I confess to having run power stations on fossil fuels and to have been the purchasing manager for Ireland’s power utility, buying coal and oil from around the world for burning in Ireland. I also confess to having been the Chief Executive of Bord na Móna, the Irish Peat Development Authority, which extracted turf from Ireland’s extensive peatlands for burning in especially designed power stations. Under my guidance we released 10 million tonnes of CO2 per year So when it comes to fossil fuels, I’ve been a sinner. A big one. But then I saw the light and reformed, even when I was CEO of Bord Na Móna. I’m a chemical engineer, so I’m supposed to know something about chemistry. I had to accept the scientific evidence about the effects of burning fossil fuels, about the growing concentration of carbon in the atmosphere and about the threat of global warming. So, I did what a good engineer should do, I sought a technical solution to a technical problem - how to replace a dirty fuel with a clean fuel. And that’s how I came across wind. As CEO of Bord Na Móna I built the first wind farm in Ireland in the early 1990s. It was a pioneering effort, and do you know what? Twenty three years later it’s still working, still generating electricity, all the capital paid off, with no cost of fuel. But I am not the only sinner who has repented. All around the world men and women of vision have created a global industry that is now supplying very large amounts of electricity to customers, while abating the production of greenhouse gases. All of you in this room today are a part of this inexorable and inevitable move to a clean energy future. I want to congratulate you for your role in making South Africa one of the leading countries in the world for wind and solar energy. Without your efforts, without the determination of SAWEA and others, and without the partnership and leadership from the South African government, we would not have made the progress, which we gathered last night to so rightly celebrate. Johann has asked me to say something about the wind industry in other markets. To put South Africa’s achievements in a global context. My company, Mainstream, has been developing wind and solar generation in Europe, the Americas and Africa since 2008, so my thoughts are shaped by our experience in those markets. I would like to say something about two of what I call the four “abilities” of wind and solar power. There are two “abilities” which need to be mentioned in passing as others will look at them in more detail. The first is deliverability – and we know from CSIR’s excellent research that the ability to deploy new renewable generation quickly here in South Africa has had a significant economic value in terms of meeting unserved demand. And, The second is reliability – where in a country like South Africa we can see a regular pattern of generation driven by the rising of the sun and the heating of the interior, meaning that wind energy can provide consistent and dependable electricity when it is most needed. I want to look at two others: Their affordability – and we know here in South Africa how the REIPPP process has driven prices to a very competitive position in comparison to new fossil generation. And, What I call the dependability of these new technologies. We can see if we look to the future – not the far horizon, but to tomorrow, as the world we know becomes increasingly urbanized. We can see already the growth of vital demand-side technologies – including storage – which will revolutionize the delivery of electricity to all of us. It is clear that we are coming to depend on renewables to deliver that future. Affordability Let me turn first to affordability. The transition from a high to a low carbon economy requires the biggest ever investment in infrastructure, in the way we manufacture, distribute and consume. It is not just an unprecedented challenge, which it is, it is also an unparalleled business opportunity for those of you with vision, foresight and courage. In fact, it is an unparalleled opportunity for entrepreneurs. Some years ago I put it this way: we are entering the era of the electric economy, in which there will be no coal and no petrol, or no gas used in the generation of electric power. In this era, electricity demand will continue to rise, and as aggregate demand goes up costs come down. Just think about this for a second. In a number of countries solar energy is now cheaper than wind on high radiation sites, which in turn is cheaper than new coal, which is cheaper than oil. Over the past five years the cost of wind has come down by 55%, while solar, wait for it, has fallen by 80%. This is the classic J-curve at work with a vengeance. It’s a product of economies of scale, greater efficiency and, of course, breakthroughs in technology. In the case of solar PV every time global production doubles unit costs fall by 24%. It’s analogous to Moore’s Law for microchip. In fact, it’s called Metcalfe’s Law. And we’re not at the bottom of that particular J-curve as yet, we have no idea when it will go asymptotic. Put another way, in their report published to coincide with the Copenhagen COP summit, the IEA predicted that there would be 20GW of solar pv installed in the world by today. The actual figure is 180GW, and wind has enjoyed a similar trajectory, far outpacing official predictions, as its cost has fallen. Here in South Africa what we know from the REIPPP process is that new wind is now half the projected cost of new coal, and that new solar is closing in. This is a truly remarkable achievement by this industry, but it is not unique. In markets across the world new wind is cheaper than new coal and new gas. In their October update to their annual Levelised Cost Of Energy survey, BNEF said that: …the global average LCOE for onshore wind nudged downwards from $85 per megawatt-hour in the first half of the year, to $83 in the second half, while that for silicon PV solar fell from $129 to $122. In the same period, the LCOE for coal-fired generation increased to $75 in the Americas, to $73 in Asia-Pacific, and to $105 in Europe. The LCOE for combined-cycle gas turbine generation rose to $82 in the Americas, to $93 in Asia-Pacific and to $118 in EMEA. So not only are wind and solar energy now cost competitive with fossil fuels, but the cost of fossils is already rising even at a time of weak global demand. Last week, Chile’s National Energy Commission awarded contracts for the supply of 1,200 gigawatt hours of energy to unregulated customers in Chile. Thirty-one companies competed for the 20-year contracts, with wind and solar projects going head-to-head on price with coal generation plant. As the winners were announced the results threw up some significant facts which amplify what we are seeing here in South Africa, and what Bloomberg reported in other markets. Wind and solar outbid fossil fuels on price, resulting in 100% of the power contracted being awarded to renewable energy plant. The average price of $79.30 per megawatt hour was a 40% drop from the $130/MWh in a similar tender held in 2013 and prices ranged from $65/MWh to $97/MWh. Notably, the second largest power generator in Chile bid a price of $85/MWh for power to be supplied from a coal plant. 65% of the total power will be supplied by two wind farms developed by Mainstream, which bid a price of $79/MWh. The remainder will come from three solar projects which ranged in price from $65 to $68/MWh. What we are seeing in South Africa, in Chile, and in many other markets is a remarkable achievement, given that coal and gas generators are not yet, in most markets, paying a carbon price for their generation. What is happening however, is that investors in companies with large inventories of carbon assets are getting nervous. Carbon pricing and carbon fines are being priced into company valuations. This is why Mark Carney, the Governor of the Bank of England, has warned that investors in fossil fuels face potentially huge losses and that the assets of fossil fuel companies could be left “stranded” by tougher rules to combat climate change. The exposure to this risk included insurance companies, a paradox you might say. At the same time as Mark Carney was issuing his warning the Prudential Regulation Authority published a report identifying potential climate risks for the UK insurance industry, which manages £2 trillion in assets. COP and carbon pricing As you know, COP 21 will be held late next month in Paris. This Climate Change Summit will be held under the auspices of the UN with the objective of achieving a legally binding universal agreement on capping and then reducing the level of carbon emissions into the atmosphere. 155 countries have submitted plans so far. These already cover 88pc of global CO2 emissions and include the submissions of China and India. Taken together, they commit the world to a reduction in fossil fuel demand by 30 to 40 percent over the next 20 years, and this is just the start of a revolutionary shift to net zero emissions later in the century. As Christiana Figueres, the UN’s top climate official said recently: “It is unstoppable. No amount of lobbying at this point is going to change the direction”. COP 21 will augment and universalize the momentum towards a zero carbon economy. And it’s virtually certain the solution will be putting a price on carbon, a proper price that internalizes all its social costs. The Chinese have already chosen carbon pricing as their primary policy instrument for reducing carbon emissions, as the EU did a decade ago, as many US cities have also done, and as many in business accept, When the price of carbon goes to €30 tonne, as it inevitably will by 2030, then the game will be finally over for fossil fuels. It’s only a question of when. I say “let the polluter pay”. Dependability – the future According to the United Nations’ most recent report on urbanization, globally, more people now live in urban areas than in rural areas, with 54 per cent of the world’s population residing in urban areas in 2014. In 1950, 30 per cent of the world’s population was urban, and by 2050, 66 per cent of the world’s population is projected to be urban. How can wind energy – and renewable technologies more generally – deliver the power that will help build and sustain this future? I see zero energy buildings becoming the norm, even becoming net producers of energy. Think of the potential of photo active roofing materials that turn solar radiation into electricity, electricity that would then power everything within the building while heating it and cooling it, and all done in real time with smart appliances and smart grids. In short, Ladies and Gentlemen, we are moving towards the era of complete interconnected renewable systems, in energy and manufacturing. We are heading into an era where we redesign everything we do, and the way we live. Probably the most exciting aspect of this vision is the city of the future, in which everything is connected to everything else through the internet, the internet of things, as it is called. An American company, called NEST, has already put a system on the market for managing the interconnected home in which all the domestic and personal devices are connected together, and in which the home is connected with all other homes – and with all other buildings, as well as power generators and distributions. We are heading into a world of distributed power generation and consumption where the monoliths of electricity generation, the huge great utilities that we are all familiar with, will simply become a thing of the past. It’s already happening. For proof, just look at their balance sheets. Or their corporate plans. If you do then you’ll quickly agree that the future is already upon us. Conclusion In conclusion, let me restate the essential truths that we see across the world. That wind and solar energy are supplying low-cost, low-carbon, and highly reliable generation today. That wind and solar energy will provide the electricity that will power the cities, homes and businesses of tomorrow. 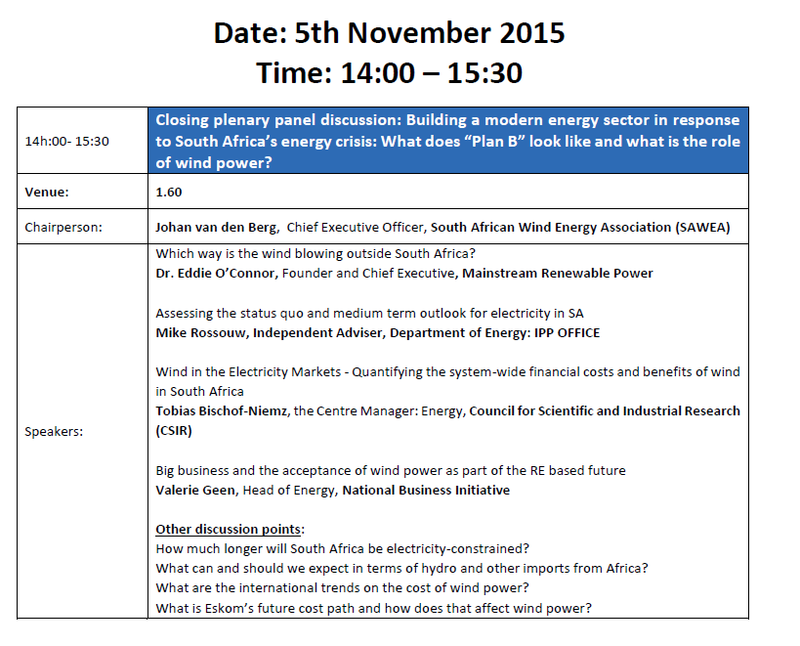 That South Africa has a clear path to its energy future. 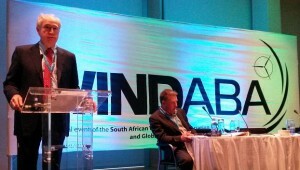 It is one where wind and solar energy will deliver affordable and dependable electricity not just to South Africa but to its neighbours as well, in a fully open and interconnected Southern African power pool which uses that power to create prosperity and growth. We are in South Africa to help build that future, and I congratulate you again on the industry that you have built in this country which is so clearly powering the winds of change. Thank you.